I’ve been fascinated with featured snippets since they hit the Google search results, and I’ve written a number of posts about them over the past few years. During that time, I have conducted a boatload of research to determine when they get surfaced, how quickly that happens, how to win featured snippets, and how to retain them. The reason I’m so fascinated by featured snippets is simple. Based on their placement and SERP treatment, they can end up driving massive amounts of traffic to websites, while also building near-instant credibility. When digging into the data, it’s hard to overlook the power of Google featured snippets. One thing that has stood out is how temperamental the featured snippet algorithm is. I’ve seen sites gain featured snippets, only to lose them to another site, then regain the snippet, only to lose them again. And all of this can happen very quickly. Based on my research, it seems the algo is continually looking for the best answer, even if it continues to change, swap results, grab completely new results, etc. 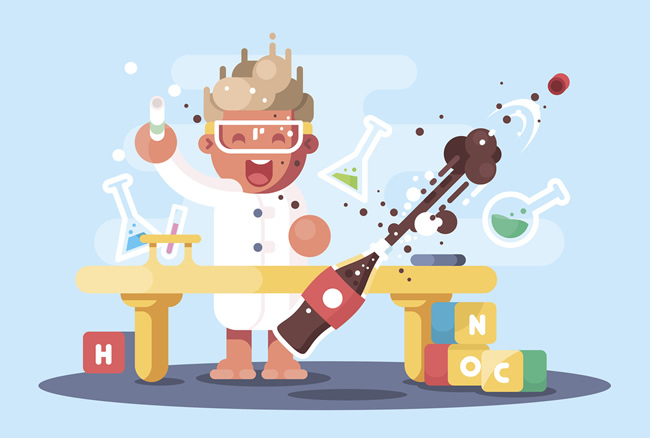 So we know featured snippets are dynamic, they can change quickly, and they can be personalized. But how fast can they be surfaced, displayed, and change based on breaking news? For example, if there is breaking news, how quickly can Google return a featured snippet containing the latest information for the topic? Well, I recently saw some examples of this happening and they blew me away. Although the example below is focused on sports, this might be happening across categories. And with the recent news of featured snippets being shown more often in the SERPs, I’m wondering if featured snippets based on breaking news are impacting those numbers. I’ll see if I can find more examples of this across other categories. If I do, I’ll update this post with more information. Well, that was fast. I was watching Thursday Night Football and the Seahawks were hosting the Rams. It was hard to overlook the crazy bright green uniforms that the Seahawks were wearing… That was based on the Color Rush uniforms the NFL created, with the proceeds of Color Rush jerseys going to a good cause. Anyway, the Seahawks went on to crush the Rams 24-3, but I couldn’t help but think many people were firing up Google to learn more about the bright green uniforms. 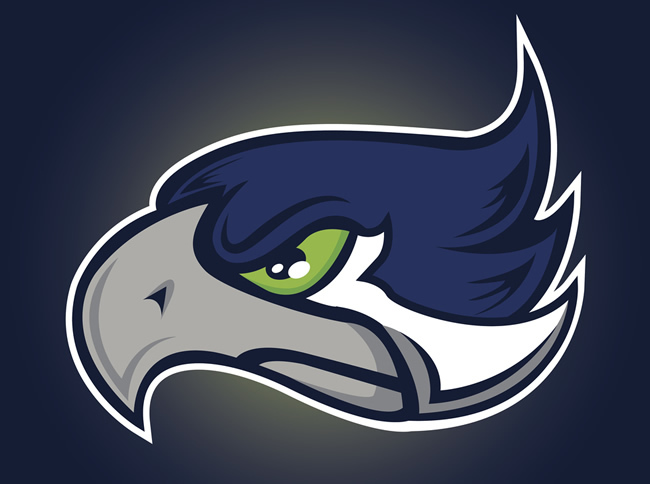 The next morning I was explaining the uniforms to my kids, why the Seahawks were wearing them, etc., and I decided to quickly Google “seahawks uniforms” to show them what the uniforms looked like. And boom, I saw a featured snippet for the query that returned an article written at game-time. That’s pretty amazing, considering the article was published right when the game was starting, less than twelve hours before I searched! 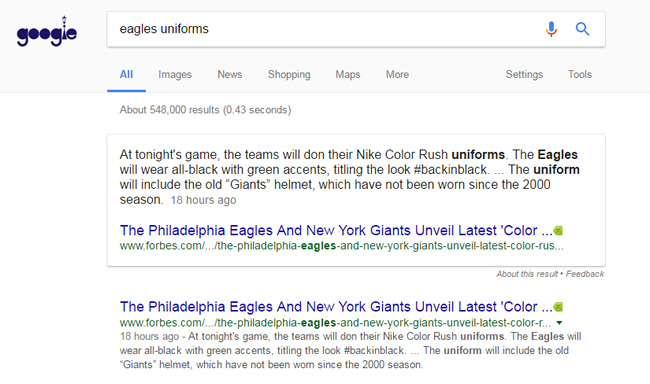 Note, there was already a featured snippet for that query, but it wasn’t based on the color rush uniforms from 12/15. The new snippet focused on that topic, but from an article that was just written. So, we see that information for featured snippets can be surfaced extremely quickly when Google sees a lot of query demand, but we also see that the algo is continually working to surface the best snippet possible (so it had already changed the snippet just a few hours later). 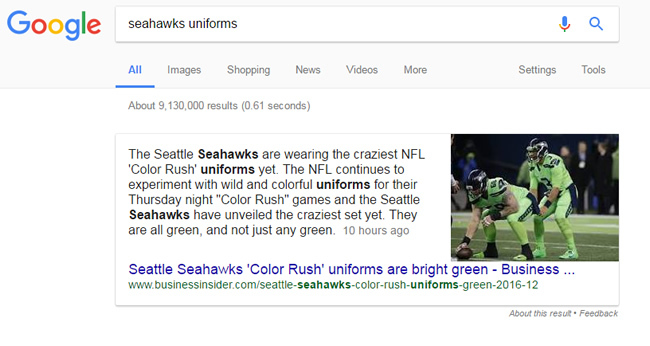 Basically, the latest news about “seahawks uniforms” was already surfaced in the featured snippet. Later that day I checked back again, and the original featured snippet was back! Yes, it changed once again. Remember my comment earlier about the temperamental algo? So I tweeted that the snippet had changed once again and received an interesting reply from someone on Twitter. Stuart Kearny from slant.co replied about the snippet feedback UI he was seeing (which is also interesting). But I quickly saw that his featured snippet was not the same one I was seeing. Stuart is located in Northern California and he was seeing a different snippet from a northwest news publication (at the same time I was seeing a snippet from another site). The article was published that day (12/16/16). Featured Snippets Based On Breaking News – Anomaly or New(er) Feature? 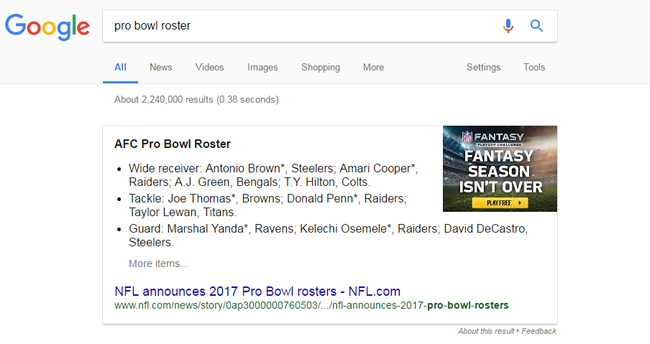 This was the first featured snippet I have seen with information based on breaking news, so it definitely caught my eye. Now, Google recently explained that it was using human-assisted AI to train its featured snippet algorithm to surface the best upshot from articles (for snippet descriptions), so that could also be in play here. It’s hard to say for sure, but it’s entirely possible. The timing is very interesting, to say the least. Yet Another Example, Also From The NFL! So I picked up another example this week when the NFL pro bowl rosters were released. I quickly wanted to see the list and performed a quick Google search. As you can guess, I saw a featured snippet containing the information! It was another great example of blazing-fast featured snippet customization by Google. It’s weird they were both about the NFL, but hey, there was some hot NFL news recently. Again, it seems featured snippets are being shown more often (based on data from Mozcast and RankRanger). You can read Barry’s post on Search Engine Roundtable for more information about that. So maybe these new(er) featured snippets based on breaking news are contributing to the increase. Hard to say at this point, but worth noting. I’ve always known Google can pre-process featured snippets quickly, but now we know that Google can both pre-process and display them very quickly based on breaking news. That means you can go after featured snippets for recent news, even if the query already has a snippet in place. Again, I’m only seeing this for sports now, but they may be impacting other categories. Featured snippets are ultra-dynamic, especially for breaking news. They can change quickly, revert, and then change again, all within a few hours. Don’t get discouraged if this happens. Google is simply looking for the best possible answer. They can be personalized. As Stuart’s example showed us, featured snippets based on breaking news can be tailored based on a number of factors. For example, search history, location, etc. 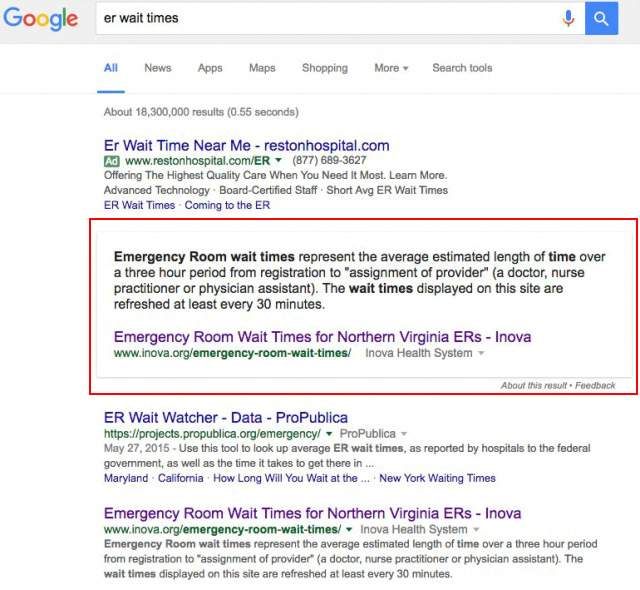 Beyond the initial breaking news timeframe (a few days), Google can surface featured snippets from any post regardless of timing for the query at hand. 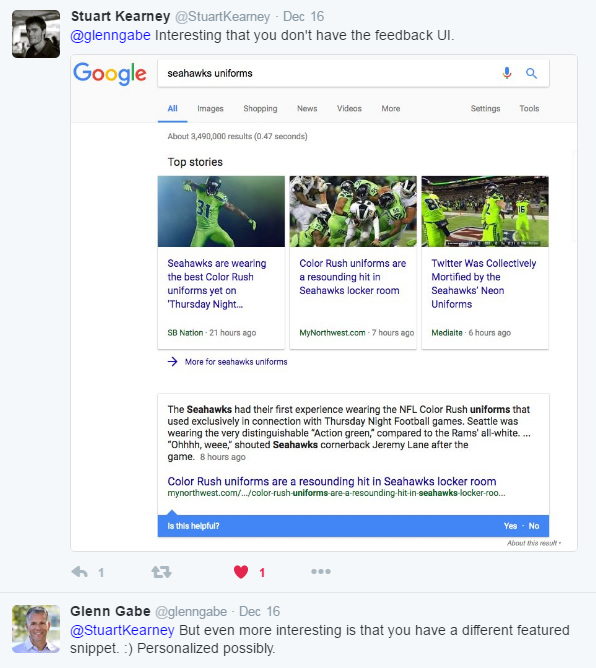 For example, the featured snippet for “seahawks uniforms” is now pulling data from a post written on 12/11, when the game was on 12/15. But right after the game on 12/15, Google was surfacing featured snippets from posts written right at that time. The algo is getting smarter. Summary – Featured Snippets Based On Breaking News, A New Frontier? Summary: Yes, it’s happening again. There was a significant Google algorithm update on 11/30/16, following an update on 11/10/16 that was partially reversed on 11/18/16. And the 11/30 update is showing a connection to previous quality updates (AKA Phantom). Let’s explore what’s going on in Google Land. When writing about the November 10, 2016 Google algorithm update, I mentioned this has been one of the most volatile falls I’ve seen from an algo update perspective. Well, now we are nearing winter, and the volatility hasn’t calmed down! I picked up a substantial algorithm update starting on November 30, 2016, with many sites seeing significant movement (both up and down). Some sites absolutely surged, while others tanked. But to make matters even more complicated, I’m now seeing partial reversals starting on December 13, 2016. So just like the November 10 update, there are some sites reverting back to their pre-November 30 levels. It’s important to note that not all sites are reverting. Some have stayed at their new levels, while others have either surged more or dropped more. Yes, it’s even a crazier time in Google Land, which is saying a lot given the amount of changes Google pushes out on a regular basis. Remember, there are hundreds of updates rolling out each year, but only some are significant. Those are the updates I typically cover here. For example, the June 29, 2016 update, November 10, 2016 update, etc. Significant movement on 11/30. It was BIG. I reached out to SEMrush about some of the severe spikes I was seeing starting on 12/13 and they got back to me this morning. There was a database update that could be causing some large spikes on certain sites. That doesn’t impact the 11/30 or 12/8 trending, but it is impacting the extreme spikes seen on 12/13. Note, I’m still seeing movement on some sites impacted by the 11/30 update during the 12/13 and 12/14 timeframe, but not as extreme as what SEMrush was showing. And now Barry Schwartz is reporting a possible update on 12/15. Like I said earlier, this is one of the most volatile few months from an algorithm update standpoint I’ve ever seen. Now, just like I saw with the 11/10 update, I am seeing some sites reverse course starting on 12/13. That’s exactly what I saw with the 11/10 update with some sites reversing course on 11/18. It was fascinating (and crazy) to see that happen, but it’s happening again. When analyzing sites seeing impact, it was easy to see that some had a connection with the 11/18 update. This leads me to think that Google has been refining whatever they rolled out on November 10. I can’t say for sure that’s what is going on but it sure makes sense. Again, some sites saw a complete reversal of the impact from 11/10 on 11/18. Again, that leads me to believe Google was either testing the mobile-first index or there were flaws in the algo. In my post about the 11/10 update, I wrote that Google could have been testing the mobile-first index. I saw many mobile problems while analyzing sites impacted by the update, and the timing made complete sense. Just a few days before that update, Google wrote a post about the mobile-first index and explained they were testing it in the wild. The update on 11/10 (or at least part of it), could have been the mobile-first index in action. Now I’m seeing similar things while analyzing sites impacted by the 11/30 update. That includes mobile popups, interstitials, mobile UIs breaking, and other horrible mobile UX problems. I can’t say for sure if we’re seeing another test of the mobile-first index in action, but we very well could be. Beyond just mobile problems, I saw many of the usual suspects from a Phantom standpoint. If you’re not familiar with Phantom, then read my two-parts series about Google’s quality updates on Search Engine Land. I saw many “low quality user engagement” problems while analyzing the 11/30 update. That included ads weaved into content, broken UIs, aggressive monetization (in several forms), and more. 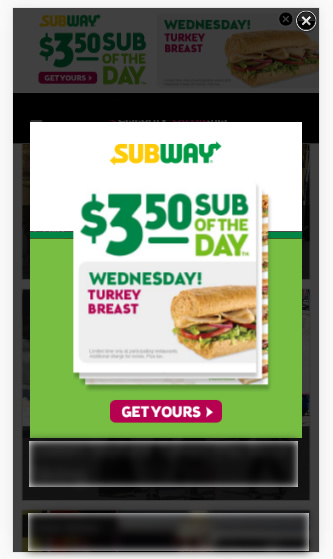 For some sites, it was hard to distinguish the real content from the ads. I mistakenly clicked a few ads and was whisked downstream to advertiser sites several times. And some of those sites were overly aggressive with their own tactics. Again, that’s a double-whammy from a user experience standpoint. Like I’ve said repeatedly about Phantom, hell hath no fury like a user scorned. Heavily reviewing your mobile setup to ensure you are providing the same content that you are on desktop. Remember, the mobile-first index will use the mobile page for ranking purposes. So make sure you are providing the full content via mobile. Also, ensure your mobile setup provides the best user experience possible. For example, don’t use mobile popups or interstitials, don’t weave giant ads into your mobile content that heavily impact the user experience, don’t have broken mobile UIs, etc. Beyond the mobile-first index, Google will be rolling out its mobile popup algorithm on 1/10/17. Beware. And beyond mobile, I would analyze your site through the lens of Google’s quality updates (AKA Phantom). Look for barriers that could be inhibiting the user experience, check for aggressive monetization, weaved ads in content, broken UIs, check fetch and render to ensure Google can see all of your content, and more. You can read my previous posts about Phantom to learn more about what I’ve uncovered. Summary – The Crazy Fall of Algo Updates Continues… Stay Tuned. As I mentioned earlier, the fall of 2016 has been one of the most volatile I have seen. And the volatility continues with the 11/30/16 update (and partial reversals on 12/13/16). I recommend checking your stats as soon as possible to see if you’ve been impacted. And if you have, follow the recommendations I provided above (and in my other posts about Google’s algo updates). That’s how you can surface potential problems causing the drop. Again, I’ll try to update this post with more information soon.